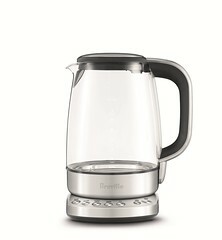 The Breville IQ Kettle™ Pure – - With 5 temperature settings and a soft opening lid, it’s the kettle that knows the ideal temperature for tea or coffee with the purity of glass. A. Soft Opening Lid. B. Lid Release Button. C. Scale Filter. D. German SCHOTT Glass Jug. 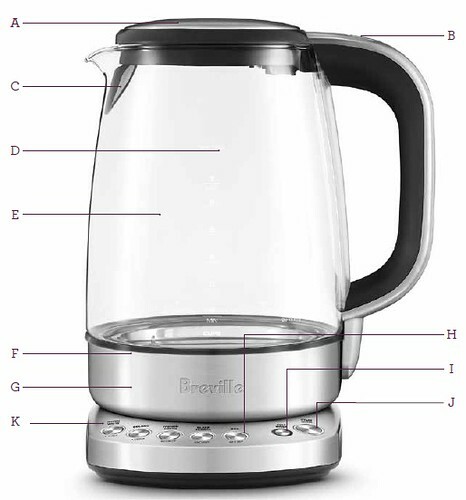 E. 7 Cup/1.7 Liter Capacity. F. Rapid Boil 1500 Watt Concealed Element.